Starting from his anxiety about vehicle pollution, Anggi Ramdani and five students from SMK 1 Lemahsugih, Majalengka Regency innovated to create an electric-fueled Car. The car named “Parikesit Electric Road Vechile (ERV) is inspired by a tamiya toy car that has a power source from the battery. 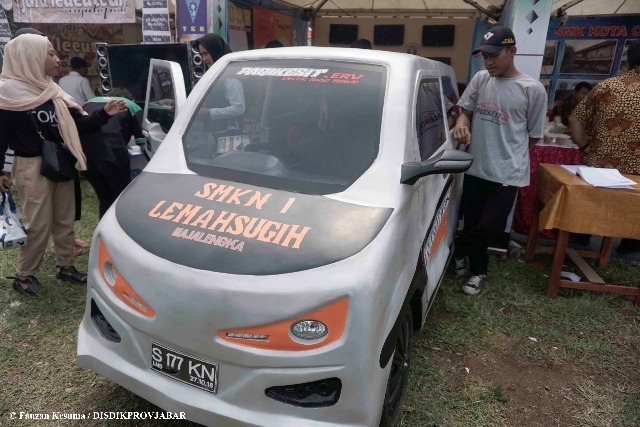 The assembled car stole the attention of visitors who attended the EPITECH XII West Java Vocational Education Exhibition held at Kerkof Field, Garut Regency, November 13-15 2018. Anggi said the project was motivated by concerns about pollution caused by motorized vehicle use. “We were inspired to make environmentally friendly cars, which go green and do not cause pollution,” said Students of Light Vehicle Engineering majors, Wednesday (11/14/2018). Whereas in the assembly, Anggi said that he was inspired by the toy car he played since childhood, namely Tamiya, whose source of energy was from the battery. This Parikesit project has been prepared since four months ago to be exhibited in the EPITECH event. “The processing time is approximately four months and is deliberately prepared for the EPITECH exhibition,” he said. He explained, Parikesit ERV is capable of driving at speeds of 25 kilometers per hour and is able to withstand loads of up to 200 kilograms. Brushless DC motor type vehicles have a maximum power of 1000 Watt with a maximum current of 20 amperes. In addition to using the battery as a driver, the material used for the body of the car is a mixture of Polyourethane and coated with resin (fiber). “We deliberately use these materials because they are easily formed,” he said. Anggi said that Parikesit ERV is still in the stage of development and improvement. Later when it is perfect, there will be opportunities for schools to start marketing to the community. “We still need to improve to improve this car, the plan is to add energy sources using solar panels and other innovations. If it’s ready, maybe the school can start marketing,” said the class XII student. With this innovation, Anggi hopes to be able to change people’s views about schools that stand in the countryside no better than schools in cities. “Why do you have to choose a far-reaching school if there are also good schools in (near) villages that are ready for the facilities and infrastructure,” Anggi added. The name Parikesit itself is taken from the name puppet. Parikesit is a child of Abimanyu and grandson of Arjuna. This entry was posted in Customized Builds, Event Report on December 5, 2018 by admin.